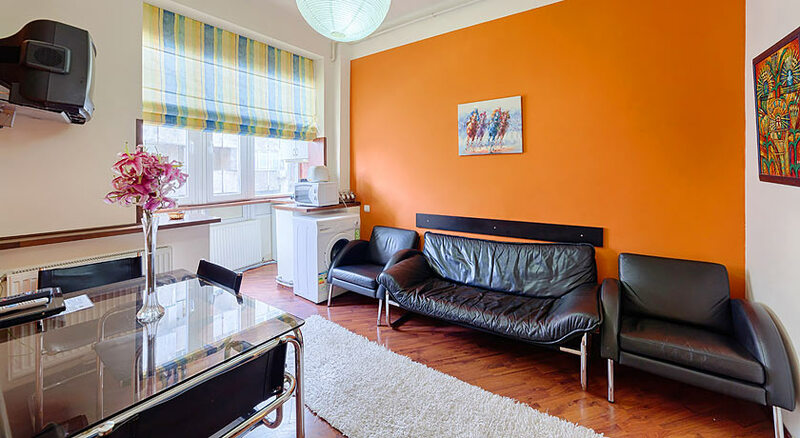 Find your accommodation with EastComfort Bucharest apartment rentals. EastComfort dispose of 50 quality apartments in Bucharest, sorted by price, number of guests or by our recommendations. Located in a well kept old building, near the center of Bucharest, the rental apartment combines modern facilities with the beauty of the antique style. It comprises a small entrance, living room, bedroom, kitchen and 2 bathrooms . The living room and the bedroom has recently restored furniture which gives the sensation you return back in time. Also, in the living, there is a leather couch with armchairs and a glass table, to make it more comfortable. The antique style makes the apartment the perfect location for art lovers and passionates of antiques. Although the kitchen is not separated from the living, it is equipped with everything you might need to cook (refrigerator, microwave oven, gas cooker, coffee maker). Besides the main bathroom (toilet, lavatory, shower cabin), there is a small service bathroom (lavatory and toilet) with entrance directly from the living.